A young woman who lost her family in the Liberian civil war returns to her homeland. Their lives torn apart by war, two brothers' paths diverge in peacetime Liberia. On the morning of May 24, a rumor started to circulate around Butaw district. The CEO of Golden Veroleum Liberia, the palm oil company that had become the lifeblood of the local villages, was going to visit. Until a riot broke out. Hundreds of thousands in donor funds remain unaccounted for while doctors complain about not getting their hazard pay. In the Democratic Republic of Congo, the Okapi Wildlife Reserve is faced with poaching, human encroachment and armed rebels. More than 50 percent of emerging infectious diseases originate in animals — including SARS, avian flu, and Ebola. But scientists believe that many outbreaks could be detected earlier and perhaps avoided altogether. Wildlife poachers and the African continent's seemingly perpetual civil wars were long thought to be the greatest threats facing the last remaining population of mountain gorillas in the world. Now, say conservationists, disease transmission from humans to primates might pose an even greater danger to their existence. "Gorillas are not immunized against a lot of the viruses we get as humans," explains Eddy Kambale, a veterinarian with Gorilla Doctors, a group founded in 1986 and dedicated to treating sick or injured gorillas in the wild. "One virus can kill an entire population." Mountain gorillas are critically endangered, according to the International Union for Conservation of Nature. Fewer than 900 of them remain in the lush forests that straddle the borders between the Democratic Republic of Congo (DRC), Rwanda, and Uganda. Kambale and the Gorilla Doctors aim to ensure that the population remains healthy and stable. VICE News caught up with Kambale in the Virunga National Park in the DRC. He was checking up on a family of gorillas, but was particularly anxious to locate an injured adult male named Mawazo, who he treated two weeks previously. Gorillas share about 95 percent of their genetic make up with humans. This makes disease transmission between the two species particularly easy. The recent outbreak of Ebola in West Africa, which may have originated from infected bushmeat, is just the latest instance of how the health of humans and wildlife are sometimes intimately connected. But the problem cuts both ways. "The most common illness we see in gorillas is respiratory disease, like influenza," Kambale told VICE News. Gorillas, he adds, are most likely to pick up the virus from visiting tourists. Because of this, wildlife enthusiasts, who want to catch a rare glimpse of a gorilla in its natural habitat, must wear a face-mask covering the mouth and nose. The stakes are high — infectious disease accounts for about 20 percent of gorilla deaths in the wild. Kambale has worked with gorillas since 2004 and is accustomed all sorts of setbacks. He's been charged by angry primates and detained by rebel armies that patrol the contested eastern region of the DRC. But, standing in the lush Virunga National Park, a different sort of problem has frustrated his search for the injured gorilla — bush elephants, which cut a huge path through the jungle, obscuring the mountain gorillas' tracks. "It's difficult to find the real trail, the one that belongs to the gorilla," he told VICE News, as the roar of several elephants echoed through the trees. "Not to mention, elephants are very aggressive. They can kill you." Park rangers tasked with tracking the gorillas join Kambale on each of his expeditions, providing assistance and security. They're armed in case of stumbling upon angry elephants, or worse, a poacher. Kambale says that with so few gorillas remaining in the wild, national park officials check up on the animals every day. But the daily interaction between trackers and primates, like the presence of tourists, comes with the risk that the trackers might infect gorillas with some sort of sickness. After hours of trekking through towering groves of bamboo and avoiding vicious army ants and thorny bramble, Kambale and his team locate Mawazo and the family over which he presides. The group has eight gorillas, most of which are males. Mawazo and another silverback named Kidogo, says Kambale, are at war over the few females in the group. While Mawazo had consistently emerged the winner, the fights are taking a toll. On Kambale's last visit, a chunk of skin hung from above Mawazo's left eye, making him more susceptible to infection. When an gorilla gets sick, Kambale and his team might administer an injection of antibiotics using a dart gun. In critical cases, the team sometimes separates an injured gorilla from the rest of the group in order to suture wounds. It's risky work — family members often become enraged when one of their kin is isolated, sometimes becoming aggressive and charging at the veterinarians. "It's hard to make the decision to intervene," Kambale told VICE News. "In life, there is never zero risk, anywhere." Kambale takes notes on the health of each individual. He monitors the pace of their breaths and scans their eyes and nose for any liquids that might indicate the onset of illness. Everyone seems healthy, says Kambale, snapping a few photos of the group, particularly Mawazo, whose wound seems to be healing well. An hour has passed since finding Mawazo and his group and the sun is beginning to slip behind the mountain. It's time for Kambale and his team to make the trek back home. The gorillas too must start to build their nests where they will sleep for the evening. Kambale will return in a couple weeks to check upn on Mwazao. By then, he may have lost his fight to Kidogo. Either way, Kambale says he will be there to help keep the family healthy. In the last 25 years, Gorilla Doctors has performed over 400 medical interventions. This year alone they have treated two outbreaks for respiratory disease among mountain gorillas. Neither resulted in casualties. With the right approach to veterinary care and a well-managed tourism program, Kimbale remains hopeful that these animals will continue to inhabit Virunga National Park for generations to come. "Our job is to save the gorillas, one at a time," he said. Elaisha Stokes is a 2014 International Women's Media Foundation reporting fellow in the Democratic Republic of Congo. This week, Mali announced it had become the sixth African nation to be affected by the worst Ebola outbreak in history, with the majority of infections occurring in Guinea, Sierra Leone, and Liberia. But there's a seventh country in Africa, quietly dealing with it's own Ebola outbreak: The Democratic Republic Congo. Since July, 49 people have died from and 69 have become infected by a strain of the virus genetically distinct from the outbreak in West Africa. The infections occurred the remote Equateur Province, around Boende town, located in the northwest of the country, with 'patient zero' being a pregnant woman who became infected from a piece of monkey meat and later died. From there the virus spread. But not very far. There hasn't been a new case in the Congo since October 4, and experts suspect the World Health Organization will declare the country Ebola-free by early November. "We know how to contain this virus," Dr. Jean-Jacques Muyembe Tamfum, better known in the country's capital city of Kinshasa as "Dr. Ebola," told VICE News. For the last 38 years he has been fighting the virus wherever it emerges — from Gabon to Sudan. But the vast majority of his time is spent in the DRC, where he oversees the National Biomedical Research Institute, a laboratory dedicated to the study of emerging pathogenic threats, including Ebola. The Institute is equipped with biosafety labs where samples are analyzed for quick diagnoses. They can test for Ebola, Marburg, or any other viral disease that might emerge from the Congo forest. "For really sophisticated tests, we work in collaboration with other institutions in the United States or France," Tamfum said. "But in the future we're hoping that all the analysis can be done right here, in Congo." Congo has had more Ebola outbreaks than any other nation — the latest is the country's seventh. Tamfum has worked all of them. In August he made his first trip to Liberia as part of a five-man team sent to advise political leadership in the West African nation on the best practices for containment of the outbreak. While it's not clear why Ebola has been easier to contain in Congo than in West Africa, Tamfum believes that the biggest factor might be community engagement. How Ebola science should guide America's new Ebola czar. Read more here. "What I saw was the lack of trust between the population and the medical workers and their government leaders," Tamfum said. "This created a gap." Tamfum believes that because this was the first time Ebola emerged in West Africa, the local population was unsure how to respond. "They didn't take precautions to protect themselves, because they didn't believe what they had was Ebola." In contrast, the Congolese government has been working with traditional leaders and local politicians for decades to build a community response in high-risk areas. In Congo, people are serious about not touching dead bodies, even during funeral time. "Everybody accepts that it's not the populations job to take care of dead bodies in an Ebola outbreak. It's the job of medical professionals," Tamfum explained. "This is how we break the transmission chain." The other major advantage is the geographical isolation of Congo. Most of the outbreaks have emerged in remote villages. The Congo is notoriously difficult to navigate, with poor road infrastructure, armed groups and dense forest. People who become sick are unlikely to leave the area of contamination. "In West Africa, people move freely," Tamfum. "That's another challenge." In an effort to increase African Solidarity, the Congolese government — in conjunction with UNICEF, the World Health Organization and Johns Hopkins University — plans to train more than 1,000 health workers in best practices in responding to Ebola outbreaks. Congo's Health Minister Felix Kabange recently told Reuters "We have made here what we call African solidarity in action." About 600 volunteers have been recruited in the capital city Kinshasa. It's expected that three teams could be ready to assist in West Africa by mid-November. The hope is that Congo will be able to share some of its hard earned expertise on ending Ebola outbreaks. 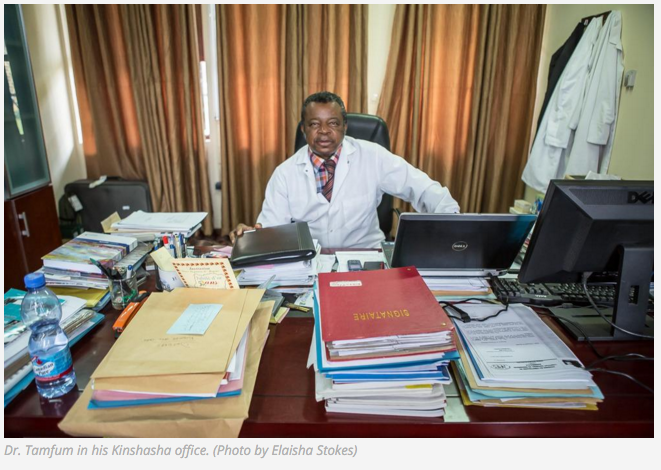 "The work we do, it's very dangerous," Dr. Stomy Karhemere, the deputy director of the National Biomedical Research Institute in Kinshasa, told VICE News. He spends a lot of time analyzing samples for emerging viruses, including Ebola. "We wear protective equipment to protect ourselves. We work under biosafety cabinets. We take precautions. We want to share that knowledge with others." This is not the first time two Ebola outbreaks have emerged simultaneously. In 1976, when the virus was first discovered in Congo, another outbreak emerged in Sudan. Scientists have noticed that the frequency of Ebola outbreaks is increasing, but this might not be cause for alarm. "What's really happening is that we're learning to diagnose Ebola faster," Dr. Tamfum. "We have a better surveillance system, and we can respond faster than ever."